JLC International offers a variety of different dew point meters, of which is Shaw’s Superdew 3. The Superdew 3 is one of the genuine Shaw dew point meters, and is a DIN style panel-mounted moisture monitoring device, designed to work in conjunction with the Shaw Sensors. The Shaw Moisture Meter sensor is a modified molecular sieve absorber that is manufactured in aluminum oxide with an outer conductor of 24-carat gold. Since the Superdew 3 has an Automatic Calibration Sensor, it allows for field calibration checks. 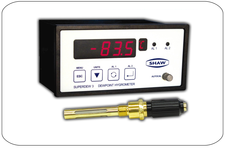 The Superdew 3 is a single channel in-line hygrometer, designed to measure dew point in process gases and compressed air. The panel-mounted enclosure provides panel protection to IP54. The combination of the highly accurate and repeatable Shaw sensor and advanced digital electronics, make this the instrument of choice for a wide-range of applications where precise measurement, control, and monitoring is critical. Each sensor is calibrated to provide overall system accuracy of better than ±2ºC (±3.6 ºF) dew point and supplied with a calibration certificate, traceable to international standards. The Superdew 3’s operation is controlled by a four button membrane keypad. The user-friendly software uses a simple menu selection process and incorporates three hot keys to enable moisture levels to be read in different units. This also allows for quick access to both alarm settings, which are two fully programmable alarm relays that can be independently set across the full operating range of the sensor. The isolated 0 / 4 – 20mA analogue output is also fully scalable over the range of the sensor. This instrument is available in an AC or DC version. The Auto-cal feature relies on the fact that each sensor is designed to give no further increase in reading when it reaches its maximum moisture level. This means that, for instance, the Silver Spot or Red Spot sensor will read –20 °C (-4 °F) dew point temperature when it is exposed to gas at –20 °C (-4 °F) dew point temperature, but will continue to read -20 °C (-4 °F) dew point temperature when it is exposed to gas with more moisture. The Superdew 3 system can therefore be calibrated very simply by exposing the sensor to anything wetter than –20 °C (-4 °F) dew point and adjusting the reading to that point on the display. For the Grey Spot sensor, the maximum level is 0ºC DP and the same principle applies. The Shaw circular calculator is a handy accessory, coming standard with each Super dew 3. It brings together many different measurement units, and enables calculations to be made for moisture levels at different pressures. On one side, is a conversion table showing dew point temperature in Fahrenheit and Centigrade, with the equivalent moisture levels in mg/water per liter, lbs/water per million cubic feet, parts per million, water vapor by volume, and water vapor pressure in mm of mercury. The other side enables any dew point temperature at any given pressure to be converted to the equivalent dew point temperature at any other pressure – with the moisture content in parts per million also shown. If interested in the Superdew 3, please contact JLC international right away to learn more about our dew point meters. Our experts are more than willing to explain further and help any with questions. Please call us at: 1-888-358-2518. The manuals are for information purposes only and shouldn’t be used for operating the instrument.